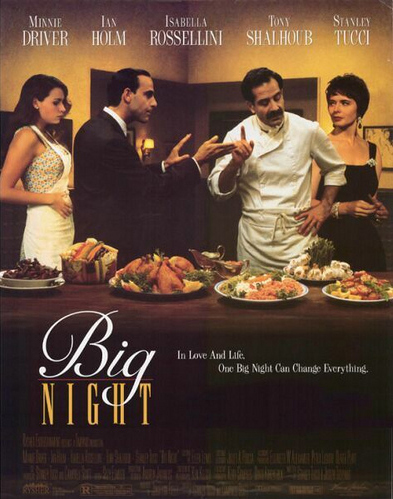 In 1996, Stanley Tucci and Tony Shalhoub starred in Big Night - directed by Campbell Scott and Stanley Tucci. That same year the Coen Brothers released Fargo and Anthony Minghella released The English Patient - two films that got major attention. It's easy to see then why Big Night was lost in the shuffle. Far from table scraps, however, this is certainly a seven-course film. Big Night is the story of two brothers trying to run an Italian restaurant in the 1950's. Tucci plays Secondo, a smooth operator with plans to fulfill the American dream. Shalhoub plays older brother Primo, a brilliant chef trying to keep the restaurant authentically Italian. When Secondo seeks advice to neighboring restaurant owner Pascal (Ian Holm), Pascal pulls some strings to get famous jazz musician Louis Prima to visit their failing restaurant for one big night. 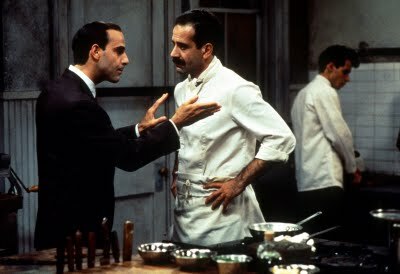 Tucci and Shalhoub work together like butter on warm bread. 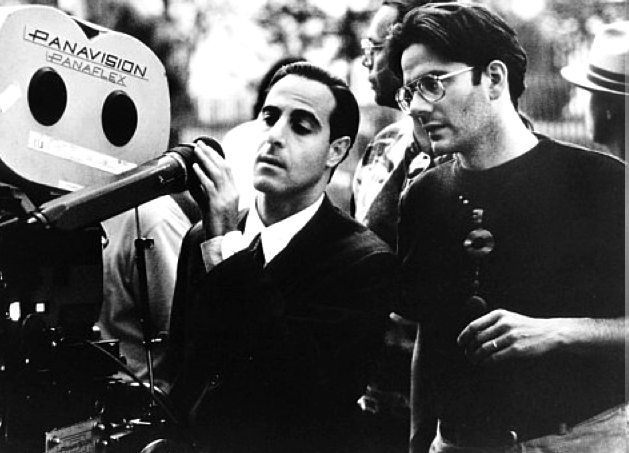 It's not surprising that the two have worked together again (Shalhoub plays a role in Tucci's follow up film, The Impostors, and Tucci cameos on Shalhoub's "Monk" TV series). The supporting cast is impeccable as well - several of whom were still in the early stages of their career. You may have to do a double-take when you notice Marc Anthony, Liev Schreiber, and Allison Janney - all of whom have had great success in recent years but were relatively unknowns at the time. There's also the established actors such as Ian Holm (Chariots of Fire, The Lord of the Rings), Isabella Rossellini (Fearless, Blue Velvet), and Minnie Driver (Good Will Hunting, Grosse Pointe Blank) rounding out the cast. I'm not afraid to claim that Big Night also has one of the best endings. It's a great example of the "show - don't tell" theory, which basically means let the body language and action explain a scene as opposed to using dialogue. It's one take with little to no dialogue and no music. It's simple, quiet and touching. I won't say more so as not to ruin it for those of you who haven't seen it. Oh...just a side note: make sure not to watch this film if you're hungry otherwise you will be tortured. TRIVIA: Co-director Campbell Scott appears in the film as "Bob" the car salesman.